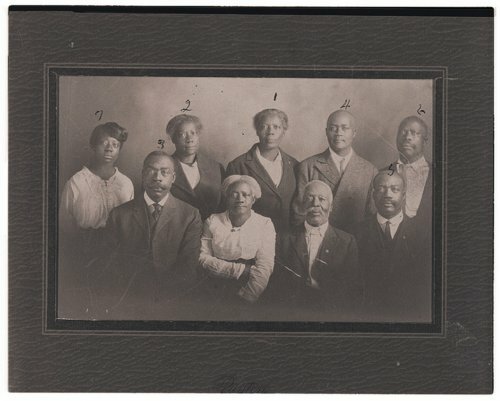 This photograph shows members of the Meridith & Harriet Sadler family. The family has been identified by their respected numbers. One; Lula Sadler Craig, Two; Cebra Sadler Alexander, Three; Frank Sadler, Four; Nealie Sadler, Fifth; John Sadler, Sixth; Thomas Sadler, and Nettie Sadler Moncrief. The parents Harriet (Hattie) & Meridith Sadler are in the middle.